George Graham Reviews Scott Henderson's "Well to the Bone"
Electric guitar celebrities tend to come in varieties arranged by style -- rock and heavy metal players -- some of whom get a lot more attention than their level of musicianship would seem to merit -- blues and blues-rock players, and jazz-rock fusion artists. The latter two categories do tend to be rather separate, by nature of the music. The blues is generally based on simple three-chord progressions, played with power and passion, while fusion is a lot more cerebral, emanating from harmonically complex compositions, with a premium on not only technical virtuosity but also inventive improvising. So it's not often that a single guitar player makes a career in both. But there are two notable and acclaimed players who have succeeded in incorporating both blues and fusion into their work. One is Robben Ford, who started in the blues, and but also created some memorable fusion with his own groups as well as performing with the L.A. Express. 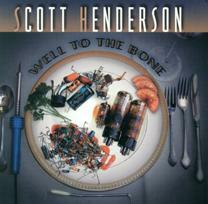 The other bluesy fusionist is Scott Henderson, whose new CD is called Well to the Bone. A native of Florida, the 46-year-old Henderson grew up playing in rock bands and doing heavy metal covers of the likes of Led Zeppelin, but also performing music from James Brown, Albert King and Buddy Guy. Henderson graduated from Florida Atlantic University, where he studied jazz, then moved to the West Coast, and eventually won postitions in the bands with some of the biggest names in fusion, including Chick Corea, Jean-Luc Ponty, and Weather Report's Joe Zawinul. In 1984, Henderson formed Tribal Tech with bassist Gary Willis, a group which is still in existence, and recorded a series of critically-acclaimed releases. In the process, he also won the readers' poll in 1992 from Guitar Player magazine in the jazz category. But Henderson considers himself more of a blues-rock player than a straight-jazz artist, and in 1994 released his first bluesy solo album called Dog Party. While maintaining Tribal Tech, Henderson also released Tore Down House in 1997, which we also featured in this album review series. That CD was a fascinating blend of blues, some of the harmonic sophistication of fusion, with some humorous lyrical material. Now, five years after Tore Down House, Henderson is out with Well to the Bone, whose title is an obvious take-off of George Thorogood's blues-rock hit Bad to the Bone. Once again, Henderson combines the harmonic complexity of fusion with a bluesy feel. But there's nary a three-chord blues to be heard. This CD has rather less added instrumentation than its predecessor, with most tracks being a trio with Henderson, drummer Kirk Covington of Tribal Tech, and bassist John Humphrey; though as on Tore Down House, there are added vocalists, including Thelma Houston, who appeared on the latter, and Wade Durham whose style spans blues and soul. Since Henderson has been performing on the road with this band for almost three years, the guitarist's original intent was to make a bluesy album, essentially recorded live. There are some tracks on Well to the Bone that have that basic sound, but once Henderson got into the studio, he began experimenting with different guitar textures and sounds, and also layering those sounds. While not as much of a wall-of-guitars as, say Eric Johnson's work, Well to the Bone does feature a lot more guitar sounds than one would normally hear on a blues album. Henderson also lets of a little of his early heavy-metal influence show through on some of the tracks, or portions of some of the pieces which can rapidly evolve from one guitar environment to another. The result is not a standard blues album, not really so much of a regular fusion recording, and hardly garden variety rock, but an interesting and engaging hybrid that features great guitar work, creative composing, and some clever musical juxtapositions that seem to come out of left field. Five years after his previous solo blues-influenced album, guitarist Scott Henderson has created another, engaging, hard-to-categorize recording that highlights his split musical personality -- a fan of the blues, but one for whom three-chord music is not enough. So he starts with a basic blues feel, and then goes all over the map, from fusion, on which his reputation is based, to country. As usual his playing is stellar, and his compositions, while hardly hummable, are fascinating for their agility in hopping from one style to another. He also provides us with a rainbow assortment of guitar sound colors. His band is solid, and each gets an opportunity for a little soloing, but the center of attention is clearly on Henderson's guitar. Even when the vocals are heard, they are mixed in such a manner that they take a supporting role. The result is an album that is definitely one for guitar fans, but one that will have a lot of interest to aficionados of fusion. Our grade for sound quality is close to an "A." The myriad of guitar sounds make for impressive listening, and the except for the semi-buried vocals, the clarity is commendable. But as is too often the case, audio compression aimed at making the recording louder, robs the music of some of its dynamics. While Scott Henderson has been keeping busy with various other projects, he has not neglected his own blues-inflected band. Though overall not quite at the level of his 1997 release Tore Down House, nevertheless, Well to the Bone is a most worthwhile recording, and if anything, more downright musically intriguing than its predecessor.